across the country from coast to coast without seeing anything." Ohhhh, I disagree with that! I've seen many interesting and beautiful things from freeways; it depends on what freeways you select and when you travel them. As mentioned in the last entry, I-64 was not the original route we intended to take to Los Alamos, NM for Jim's first race of the season. The shortest route from our house near Roanoke, VA is I-81 to I-40 through Tennessee, Arkansas, Oklahoma, and Texas. Unfortunately, part of I-40 in Arkansas was under water last week and we didn't know if it would be open when we wanted to come through this week. In addition, the day we'd be passing through Memphis (yesterday) was the day the Mississippi River was predicted to break a 60-year flood record. We didn't know if we could get through either area and we didn't want a last-minute detour that would be difficult while hauling a 36-foot 5th-wheel camper. We researched various routes and checked for road closures on them. The route that looked like our next best option was a little farther north -- I-64 and I-44 to I-40 in Oklahoma far enough west of the Mississippi River that flooding wouldn't be an issue. 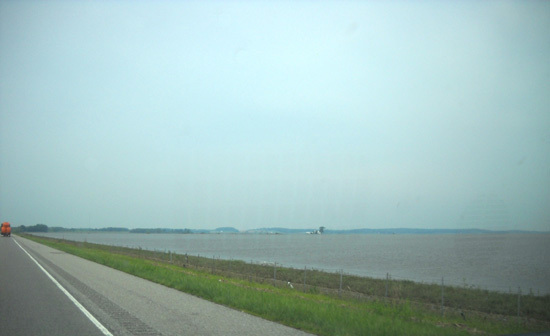 The Ohio River was also flooded, and we'd have to cross it in Louisville, KY. We read that part of I-64 was closed in that area three days before we'd reach the city. 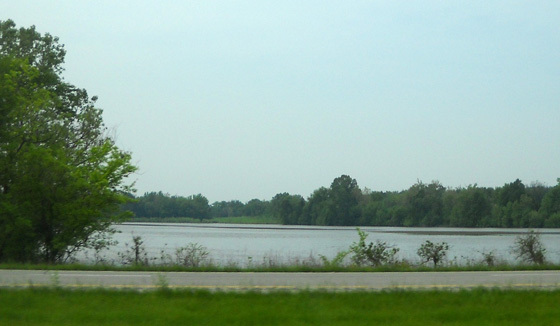 Fortunately, it was receding by the time we got there but we could still see places along the Wabash and Little Wabash Rivers farther west in Illinois where the water was still almost up to the freeway. Except for two turnpikes requiring tolls, and about 80 extra miles, we liked this route as much as or more than I-40. It completely avoid the extremely heavy truck traffic on I-81. 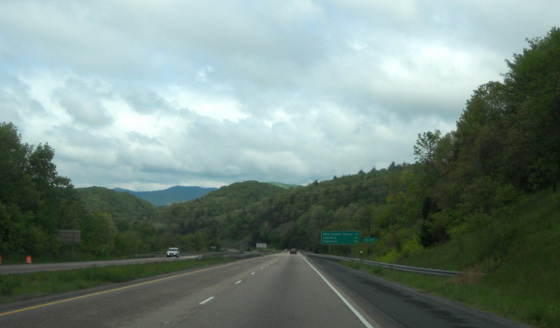 Like I-40 through Tennessee, I-64 is hilly and passes through some very scenic territory in Virginia, West Virginia, and Kentucky. However, commercial trucks are more likely to use I-40. That makes I-64 all the more appealing for a road trip for RVers and passenger vehicles! Come along as we travel from Virginia to Texas in this journal entry. If you aren't interested in the travel information, just scroll down through the photos. Most of them are "windshield" shots I took while Jim or I were driving so they include some bug spots, windshield wipers, vent shadows, and blurriness -- but they'll give you an idea of some of the scenery we saw along the way. Weekend traffic was relatively light, even in the cities through which we passed (Roanoke, VA; Beckley, Charleston, and Huntington, WV; Lexington and Louisville, KY). One reason is because this isn't a popular truck route. Even on weekends, freeways like I-81 and I-40 have lots of truck traffic. This is a hilly route that isn't so difficult for RVers but there are several reasons for truckers to avoid it unless they have to deliver goods to towns along the way. For example, where I-64 runs contiguously with I-77 from Beckley to Charleston, WV, the road winds around so much that the speed limit is mostly 55-60 MPH. 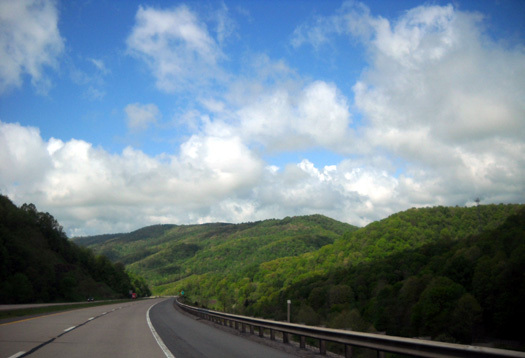 In addition, I-77 is a toll road in West Virginia. You have to pay to use it even if you're traveling through on I-64. The mountain scenery is beautiful through here. If you're driving, don't look around too much, though; I-77 demands 95% of your mental focus. It's easier to play tourist in the driver's seat in Virginia and Kentucky where the curves aren't as tight. We saw few campers on Sunday, probably because most snowbirds are farther south where it's warmer and it's too early for summer vacationers with school-age kids to be on the road. 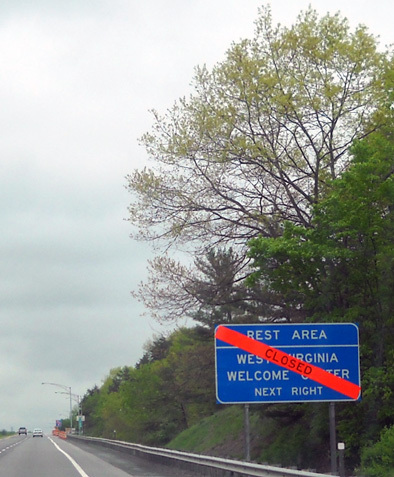 Although there was some construction near Clifton Forge, VA, and Charleston and Huntington, WV, traffic moved well and there were no real slow-downs this day. as was the rest area at about MM 108 in Kentucky. All the others were open in the westbound direction when we passed through. Unfortunately, diesel prices were generally higher going out to Texas than they were when we left Roanoke. Part of the reason was still-increasing prices everywhere. On Saturday Jim paid $3.87/gallon for diesel in Roanoke. On Sunday we refilled the tank at the Flying J in Catlettsburg, KY (I-64 exit 185) at $4.03/gallon. Prices we saw were about $4.03-$4.09 in Kentucky and Indiana and higher than that in West Virginia. Despite the mountainous terrain we averaged about 12 MPG for the day (less in the mountains, more in western Kentucky where it's less hilly). We think that's pretty good going westbound in a a truck hauling a 15,000 pound camper with its fresh water tank about 2/3 full! What helped was two new truck tires, new air and crank case filters, a front-end alignment, minimal wind, moderate temperatures, and (mostly) driving a steady 60-62 MPH even when the speed limit was 70-75 MPH. Weather and scenery: couldn't have been much better for driving! 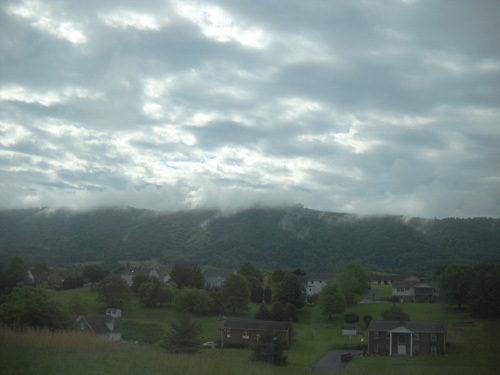 We started off with low 60 F. temps in Virginia in the morning and lots of low clouds. By late morning it was mostly sunny. Temperatures reached comfortable mid-70s in the afternoon. The scenery is great along I-64 -- not just what we drove on this trip, but also the part in Virginia that we weren't on. It's just a very pretty, mostly rural route through the mountains of Virginia and West Virginia, then through hilly farms in Kentucky and Indiana. We passed through a couple seasonal zones as we went from lower to higher elevations and back to lower elevations again on Sunday. The vegetation was summery at the lower altitudes (under 2,000 feet); as we climbed higher in West Virginia we saw different kinds of flowering plants and fewer and fewer leaves. This is a nice time of year to drive this route. Although the dogwoods were long gone at the lower elevations, they were still blooming at 2,600 feet in West Virginia. Unfortunately for the people living (and traveling) downstream where the Ohio meets the Mississippi River, however, there were big problems ahead. 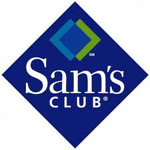 2) We saw a sign on the freeway for a new Sam's Club at exit 16 east of Louisville (Forest Hills?). It's not in our 2012 Walmart atlas. What surprised us was seeing a sign on the freeway -- that's the first time we've ever seen a Sam's or Walmart sign on the freeway. We wish they'd do that more often. Walmart at exit 105 near Corydon, IN. The store is located about half a mile south of the freeway on the right. Several semis were also parked out from the garden end of the store but we didn't see any other RVs overnight. We shopped inside the store before supper and were quickly given permission to spend the night. We ♥ Walmart for that. We had good phone, internet, and TV signals at this location. 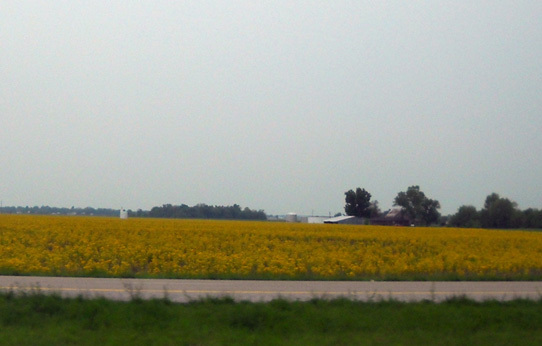 Traffic was relatively light in the morning through the southern Indiana and southeastern Illinois farmland. 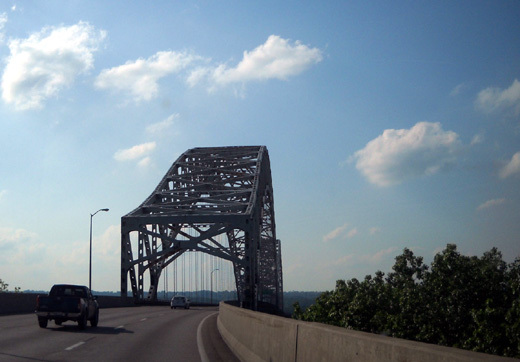 There aren't any cities along I-64 between Louisville, KY and St. Louis, MO -- that's a bonus for RVers who don't like city driving. Most of the road surfaces were good this day and there was minimal construction except on I-255 around the southern St. Louis metro area and farther south on I-44. Traffic flowed well even where it was heavy. The speed limit on I-64 in Illinois is 65 MPH for all vehicles. Even though we wanted to go only 60 MPH, that made us happy. When we've been on some of the other freeways in Illinois (e.g. I-74), trucks and RVs were limited to 55 MPH. Maybe that's through more populated areas. Interstate 64 is very rural through most of Indiana and Illinois. In fact, I-64 is pretty rural everywhere it goes from Virginia to Oklahoma. I think that's why I like it so much. Traffic became noticeably heavier and included many more semis after the juncture with I-57 at MM 78. Some of the westbound traffic went north to Chicago but so many trucks and other vehicles merged westbound with us from I-57 that it was obvious that a bunch of traffic from I-40 westbound was diverted up I-24 and I-57 to I-64 to avoid the flooded Mississippi River in Memphis. The river was predicted to crest, possibly at a new record high of 48+ feet, on this day or the next. It ended up cresting just a few inches under the previous record. Nevertheless, in places where this gigantic river is normally half a mile wide, it is currently three miles wide! Water in the river is so high it is flowing backwards in its tributaries. It's not just the Mississippi that's flooded; most of its feeder rivers and creeks are flooded, too, spreading the misery over many states through the center of the country. The terrain becomes much flatter along I-64 in western Indiana near the border with Illinois. This is where we started seeing flooded fields. Oh, my, were we in for a visual surprise! The flooding became dramatic as we approached the Wabash and Little Wabash Rivers in IL. 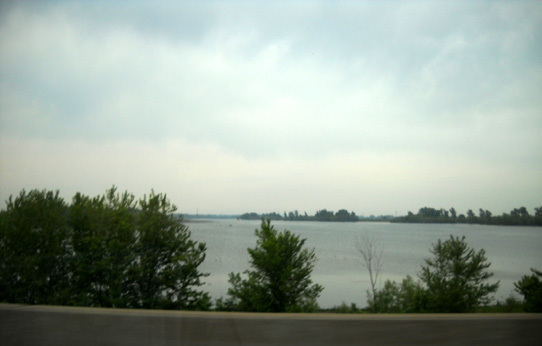 The rivers became lakes, covering thousands of acres of farmland. I was driving through this area and had great difficulty keeping my eyes on the road. Most of the flood photos in this entry are ones I took while driving. I don't recommend that, but Jim was sleeping through part of this and I wanted to record it -- because I hope I never see anything like it again. Neither of us has seen anything like this in our lifetimes (at 62, that's a lot of years!). I just kept saying, "Oh, my gosh!" over and over. OK, I also used some stronger language than that! What was particularly impressive as we rolled down the freeway was how close the flood debris was to the road -- only a foot or two away from the pavement. I don't mean a foot or two lower; I mean a foot or two away. Vertically, I'm talking about only a few inches below the surface of the road. You can see that in a couple of the photos. We don't know if any of I-64 was closed in this area. The roadbed is not that much higher than the inundated fields. The water has receded a little bit but it is only a few inches lower now than it was when it crested here (see next photo for an example of this). It was just plain eerie driving so close to the "lakes" in this area. Part of my brain knew this was supposed to be fields of wheat and soy beans and corn, not water. The other part felt like I was driving through the Florida Keys or something -- water, water everywhere. Too close for comfort: see where the water level was just a day or two ago? This freeway isn't much higher than the fields around it. I feel so sorry for the people who live here -- and everywhere else that's flooded or will be within a few days. And we'll all be paying for it eventually in higher costs for goods and services. 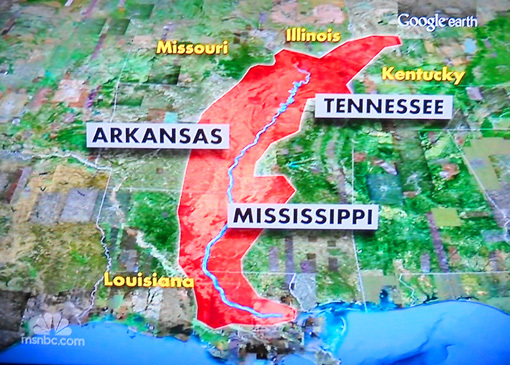 What bothers me even more are the Corps of Engineer plans to open gates to deliberately flood some areas west of the Mississippi in order to save cities that are built right along the river in Tennessee, Mississippi, and Louisiana. That just doesn't seem fair to me. When people are short-sighted enough to build a town or city on a river, I think they should be the ones to suffer during a flood, not towns and farm miles inland. Ditto for any city built below sea level . 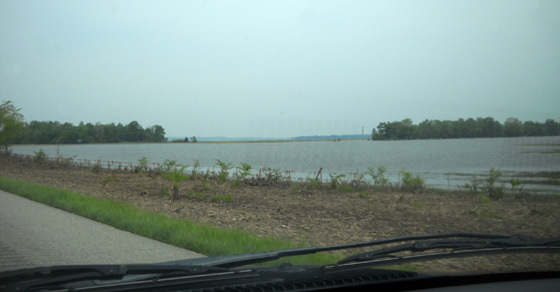 . .
We didn't see much flooding after about MM 100 in Illinois, although the terrain was still pretty flat. Fields looked like fields are supposed to look in the spring. 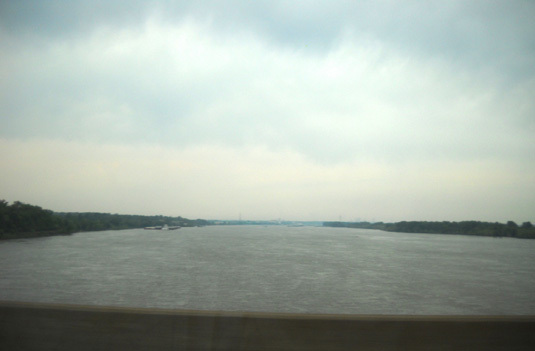 The river is even bigger downstream where the Ohio River flows into it at Cairo, IL. We took I-255 around the south side of the St. Louis metro area and avoided a lot of the traffic on I-64, I-55, and I-70 closer to downtown. 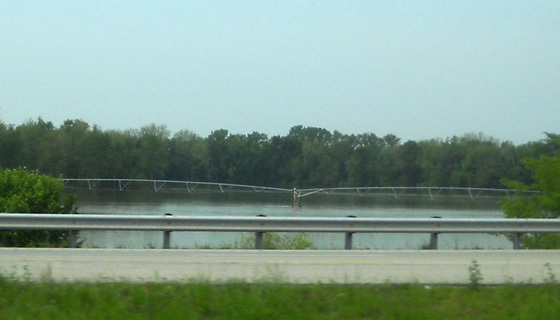 Once in Missouri on I-44, we didn't see any more flooding. What we did see in Missouri was a lot more RVs, as many as we saw both days we'd been traveling to reach the state. That's most likely because of the Ozarks and Branson, popular vacation destinations. All westbound rest areas were open from Corydon, IN to Joplin, MO on Monday. We stopped at a rest area at MM 25 on I-64 in Illinois for lunch and took another break in the afternoon at a rest area near MM 113 on I-44 in Missouri. There is a small Camping World store at MM 88 on I-44 in Missouri. We didn't stop. We got diesel twice on Monday. The average price was about $4.00/gallon. Our fueling experience in the morning near Evansville, IN was about as unpleasant as it gets (well, except for the first time we smacked the back post of the truck cab with the front end of the camper trying to make a sharp turn to get out of a gas station several months ago). Flying J advertised its price as $3.99 but the RV and car pumps were $4.35. We went across the street to BP but the car lanes were too tight, there were no RV lanes, and Jim decided not to go through the truck lanes. Then we went across the four-lane road to Pilot and went through the truck lanes because the car lanes were too tight (+ no RV lanes). We paid $4.05/gallon with a credit card (big sign said $3.99 but the fine print said that was the cash price). Jim had to pre-pay inside with his credit card. He guessed $100 would fill the tank but it didn't. He had to go back inside for his receipt and he did NOT fill the tank beyond $100. That would have required a third trip inside. Fuel stations are too often a major hassle when you're hauling a camper. Inadequate maneuvering room at too many places is just one of our problems. Having to go inside to pre-pay or get a receipt is just downright annoying. Why is it so hard to pay with a credit card at the pump and get a receipt there?? Our second fueling experience was better at a BP station at exit 208 on I-44 near Cuba, MO. The price was "only" $3.85 there and we got in and out pretty fast. Our fuel mileage ranged from 10.5 to 11.7 MPG on Monday even though the terrain wasn't as hilly as on Sunday. We had more of a headwind and we were using the AC most of the day because it was so hot and humid. We still drove 60-62 MPH. The temperature was 64 F. when we left Corydon, IN at 9 AM. The Midwest and Plains states are experiencing an unseasonable heat wave, with temperatures in the 90s F. It was in the upper 80s and low 90s as we drove through Indiana, Illinois, and Missouri -- hot and muggy. Winds from the west helped keep folks cooler but hurt our gas mileage. The sky was overcast most of the morning through Indiana and Illinois, then mostly sunny in the afternoon through Missouri. Interstate 64 is very pleasant through southern Indiana, where the terrain is still somewhat hilly and there are lots of pretty green trees and pastures. The road was noticeably flatter and less interesting through southern Illinois, then became hilly again on I-44 in Missouri. I really enjoyed the scenic, lush green countryside through Missouri. 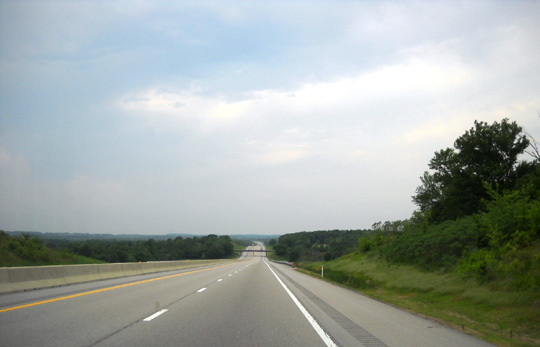 Interstate 44 runs diagonally through the southern half of the state, close to or contiguously with Historic Route 66. 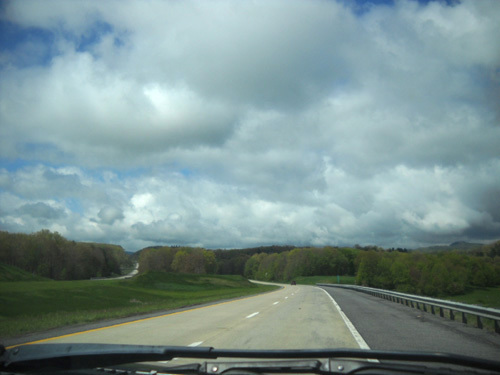 The most scenic part is marked on AAA maps as between MM 253 and 130; some of that is through the Mark Twain National Forest. Sam's Club at exit 8B on I-44 in Joplin, MO. The store is in the NW quadrant of the freeway off S. Range Line Road. We parked near a grassy area in the far corner of the large parking lot on the tire shop side of the store; we were as far away from the store as we could get, out near a Mexican restaurant. We arrived at 6:15 PM and had time to shop before the store closed at 8:30. While inside I asked a young woman in customer service for permission to park overnight. She wasn't used to such requests (most Sam's Clubs aren't) but I convinced her that we'd behave ourselves. It may have helped that I mentioned we were looking for new camper tires . . .
We really are! We're just waiting for another Sam's Club deal with $70 off a set of four Michelins and no interest for 6-18 months. They have that offer periodically. It was so hot during the day (90s F.) that it was hard to get the camper cooled off during the evening. Without electricity we can't run the AC. To cool the camper without AC we have a couple of choices: 1) turn on the Fantastic Fan in the kitchen ceiling and open just one window to pull air through the interior, or 2) open the door, two roof vents, all the windows, and turn on the ceiling fan. Both fans require power from the solar panels or generator. It was much nicer outside in the breeze so that's where we mostly stayed until bedtime. We were still pretty warm overnight. 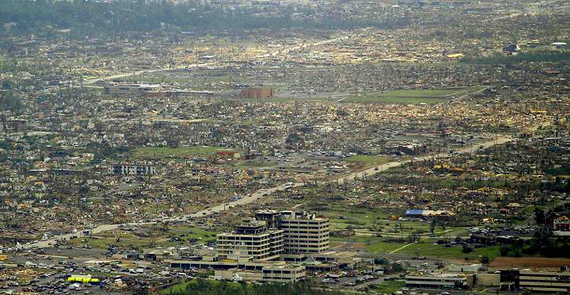 Addendum: We were totally shocked to hear less than two weeks later (May 22) that about 2,000 houses and businesses were flattened (and another 6,000 damaged) in Joplin by EF4 and EF5 tornadoes in a six-mile long path that was from one half to one mile wide. It wiped out about a quarter of the city and will affect the community for many years. AP photo from Joplin on 5-22-11; I don't know who took it. The Home Depot and the Walmart on S. Range Line Road were destroyed. Seven or eight people died in Home Depot. I know that the Sam's Club where we parked was OK, or at least not flattened; out of curiosity I called the store a couple days after the tornadoes hit to see if anyone would answer the phone, and yes, the store was open. It is located on Hammonds Drive, just off S. Range Line Road. It must have been very close to the edge of the destruction. The tornado crossed I-44 near exit 11; I know we were there. It is so strange to be somewhere and soon after, a disaster occurs there. Just in the last couple of years that's happened to us at Fort Hood, TX, Tucson, AZ, Tuscaloosa, AL, and now Joplin, MO. Of course, with all the traveling we do around the country, this could happen numerous times. We could have been in any of those places at the time of the shootings or tornadoes. It really makes me think about the fragility of life. The older I get, the more I think about that kind of thing anyway. I've said it before in these journal pages: live each day like it may be your last one. I-44 through Missouri and Oklahoma to I-40 west in Oklahoma City (with an inconvenient detour for fuel); I-40 through western Oklahoma to the Texas Panhandle; south on TX 70, west on TX 86, and north on FM 1065 to Caprock Canyons SP. Compared to normal weekday traffic through Arkansas and eastern Oklahoma on I-40, traffic on I-44 was fairly light between Joplin, MO and Oklahoma City (OKC). Interstate 44 becomes a toll road in Oklahoma. I was surprised by the number of trucks on the turnpike, considering the high cost of the toll. I assume some of the trucks were still ones that detoured westbound from I-40 in Tennessee and Arkansas due to flooding of the Mississippi River. Toll fees are much higher here than on I-77 in West Virginia. They are determined by the number of axles, ranging from $4 to $20 per segment; with the truck and 5th-wheel, we paid $9.75 on the section from the MO/OK state line to Tulsa, then another $9.75 from Tulsa to OKC. If you exit earlier, you get a partial refund. We got $1.25 back when we exited at MM 158 (Route 66) to get fuel. We remained on Route 66 hunting for fuel for several miles (long story), then took a non-toll section of I-44 through Tulsa. That was a mistake. With or without an RV, it's better to stay on the turnpike. There was considerable construction through the city on non-toll I-44; the road was bumpy and traffic was slow. We got back on the turnpike again on the southwest side of Tulsa and had to pay another $9.75 fee to OKC. The I-44 turnpike surface was very good except through some construction zones. It's a fast road despite the rolling terrain -- the speed limit is 75 MPH and there are fewer exits than on most non-toll freeways. When the turnpike ended in northern OKC we followed non-toll I-44 through the city to I-40 west. The freeway was much smoother through OKC than through Tulsa and traffic moved well. We followed I-40 to exit 124 in the Texas Panhandle. Except for some construction the freeway was smooth and fast. The farther we got from OKC, the lighter the traffic became. 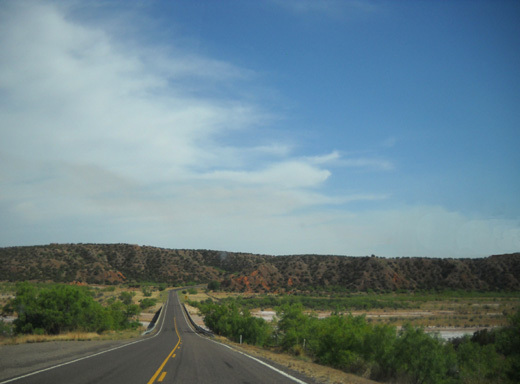 The two-lane roads to Caprock Canyons were also fine for RV travel (next photo). 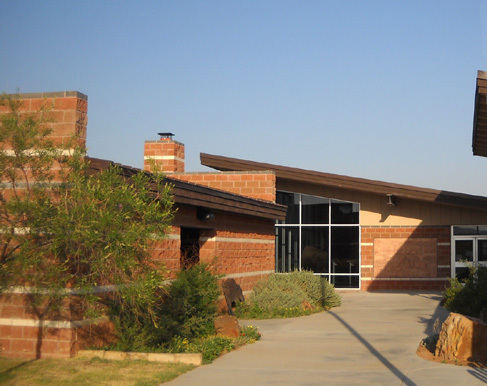 Rest areas: all were open in this 527-mile segment. It would have been nice to be able to get fuel near the Sam's Club in Joplin for $3.87/gallon but we couldn't maneuver the camper there and Jim didn't want to unhook the truck to go get it. We figured we'd find fuel OK in the morning. We stopped at a Love's station two miles west at exit 6 while we were still in Missouri on the non-toll part of I-44. There were too many people in line so we continued on. We probably should have waited and filled up there at $3.94/gallon. Finding fuel on a turnpike is different than finding fuel on your ordinary freeway. The exits on I-44 in Oklahoma are farther apart and you've got the hassle of paying tolls and getting refunds when you get on and off. We missed our next best opportunity, $3.87/gallon at a Walmart/Murphy station off the turnpike at Vinita, OK. Then we didn't have enough advance warning for the first turnpike travel center (diesel at $3.89, which isn't bad for a captive audience). We did get off the turnpike when we saw another sign for a Walmart/Murphy station at MM 158 (Route 66). To our surprise, the station was a good two miles off the freeway and then turned out to be too tight to get into/out of with the Cameo. Instead of retracing our route backwards to the turnpike, we continued southwest on Route 66 as we hunted for a larger gas station. We finally found fuel for $3.84/gallon at Lil' Reasor's in Catoosa, OK before leaving Route 66 and returning to another non-toll section of I-44 near Tulsa. The next time we fueled up was in western Oklahoma at the Flying J at exit 20 on I-40 (Sayre). We knew it'd be harder to find reasonably-priced diesel in the isolated stretch of I-40 in the Texas Panhandle since we would be getting off the freeway before Amarillo. It was a good decision to stop there, even though Jim isn't fond of FJ. The pickings were slim from there to Caprock Canyons. We paid $3.99/gallon at FJ but it was cheaper than anything else until several days later when we got to Amarillo on the final leg of our journey to Los Alamos, NM. Our fuel mileage averaged only about 10 MPG today despite the fact that we are carrying much less fresh water now than two days ago. The terrain was hilly, we had rather strong headwinds through Oklahoma and Texas, and we used the air conditioner all day. We still maintained a steady 60-62 MPH most of the time (slower through cities, construction zones, and two-lane roads). It was in the low 70s, very humid, overcast, and windy in the morning when we left Joplin, MO for Oklahoma. It was still humid and windy in the afternoon through western Oklahoma and the Texas Panhandle, with more blue sky and temps in the low 90s. The scenery was nice from the Missouri line to Tulsa, OK, with rolling hills and lots of trees -- similar terrain to Missouri and Indiana. There were lots of very verdant fields and numerous cattle. After Tulsa the terrain became more hilly, with fewer green pastures and more range land. The wind also picked up. We had entered a more drought-stricken area of the Plains where wildfires are a threat, not flooding. We saw periodic signs that advised, "Do Not Drive Into Smoke." 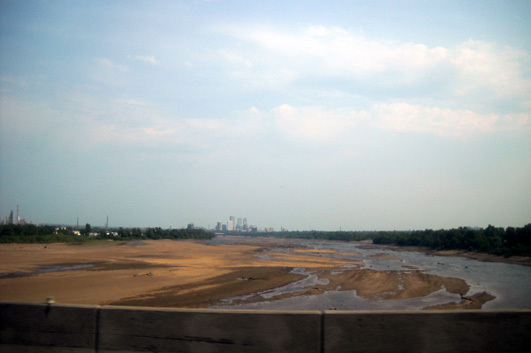 The terrain became even more prairie-like and less farm-like west of Oklahoma City. There were more pines than deciduous trees, more brown grass than green. There were still plenty of cattle. Skies were overcast in western OKC. The air was hot, dry, and very windy. The weather forecast for the next day in Tulsa and eastern Oklahoma was "possible severe thunderstorms." We sure were glad we were farther west! The sky cleared up later in the afternoon in far western Oklahoma and the Texas Panhandle. It was still hot and windy. 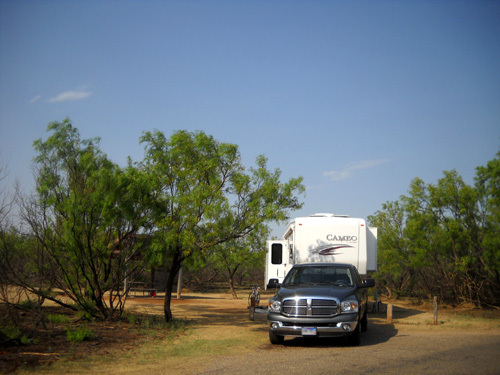 We took exit 124 off I-40 in Texas, then drove south on TX 70 to Turkey, west on TX 86 to Quitaque (pronounced Kitty-K), and north on FM 1065 to Caprock Canyons SP. 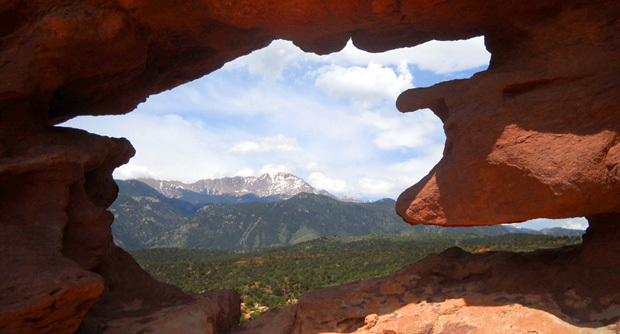 This is a scenic drive through hilly range land that morphed into rocky canyons. We saw some handsome ranches and good-looking crops (wheat, cotton, etc.) before reaching the canyons, thanks to extensive irrigation systems. Much of Texas has suffered from severe drought for several months. Fortunately, there haven't been any significant wildfires in this area. We arrived at Caprock Canyons SP about five minutes before the park office closed. Staff had already shut down the computer system so we were directed to find an unoccupied campsite in the Honey Flat CG and pay in the morning. We had a reservation and had already paid for the first night. We will be here for the next five days and nights, then continue our journey to Los Alamos, NM for Jim's first race of the season. Now do you see why I don't agree with Charles Kuralt's quote at the top of this entry, the one about not seeing anything when you travel via freeways? I think we had a pretty interesting freeway drive from Virginia to Texas. For travelers who prefer more "blue highways" and interaction with the locals, it's easy to hop off I-44 and I-40 to drive as many miles as you'd like on Historic Route 66 through Missouri and Oklahoma, then return to the freeway if you want.